Once you've decided to pursue a college degree, you'll need to condense your list of prospective schools. With so many postsecondary institutions to choose from, this can be an overwhelming process. Students who want to attend school in Kentucky will find 34 regionally-accredited state universities and colleges to consider, along with dozens of two-year programs. When evaluating colleges, students must consider a number of factors across schools, from tuition to campus life. We have applied our rigorous methodology to the latest education data to rank the best colleges in Kentucky, including the top four-year and two-year schools. Our proprietary algorithm incorporates performance marker data from federal education databases, including information on acceptance, retention, enrollment and graduation rates. Below, you'll find our list of the best colleges in Kentucky. Our list of the top online colleges in Kentucky was determined by our in-house algorithm. The list only includes schools offering fully accredited online programs. Prospective students will also find the technical dimensions and educational initiatives at each school in their profiles below. Founded in 1855 to serve the Appalachian region and the state commonwealth, Berea College was the first college in Kentucky and all of the South to host an interracial and coeducational student population. The historic liberal arts school comprises six campus centers in the town of Berea, the “folk arts and crafts capital of Kentucky.” The college is home to an innovative labor program to offset tuition costs, and prides itself on graduating students with little to no student debt. More than 32 programs are offered in arts and sciences, professional study, and independent student-designed majors. Berea also offers 15 teacher training programs and a dual-degree engineering program through the University of Kentucky. Notable alumni of Berea College include a Nobel Prize winner, the inventor of touch-screen technology, and a former U.S. Secretary of Commerce. Simmons College of Kentucky was established after the Civil War by the state's Colored Baptist Churches Convention to be the first Kentucky college for black citizens. Opened in 1879, Simmons has since expanded, secured accreditation, and has been recognized as a member of the nation's Historically Black Colleges and Universities (HBCUs.) The school offers associate degrees, bachelor's degrees, and undergraduate internship programs in business, communications, religious studies, sociology, and general studies. In addition to comprehensive student advising and a Learning Center dedicated to providing academic enrichment on campus, Simmons hosts its own marching band and varsity sports, including nationally renowned men's and women's basketball teams. The school also maintains a Facebook page for Simmons students and offers activities both on-campus and in surrounding Louisville that are specifically designed to engage and empower African-American students. Located just 20 miles from Lexington in the town of Wilmore, Asbury serves an enrollment of more than 1,325 traditional residential students. More than 30 campus buildings and facilities, including an auditorium, administration building, equestrian center, and ropes fitness challenge course, sit on the school's 739-acre estate. The college is home to 52 majors and programs across 14 academic departments, all incorporating a Christian perspective. Undergraduate and graduate degrees, adult professional programs, and certificates are available, many offered both on campus and online through an accelerated format. Popular majors include media communications, elementary education, and equine studies. In fact, with a campus in close proximity to the Derby and other national equestrian organizations, Asbury has the most comprehensive equine programs among the colleges in Kentucky, offering unique majors in equine science, equine-related business, pre-vet medicine, and more. The school's campus is home to weekly chapel and devotional services, as well as more than 10 NAIA coed and men's and women's athletic teams. Originally a municipally funded enterprise, UofL joined Kentucky's university system in 1970 as a state-supported public research institution. The school's 287-acre campus near downtown Louisville houses seven buildings and serves the largest metropolitan area among colleges in Kentucky, with a student enrollment of more than 22,000. UofL also includes a Shelby campus, as well as its own Health Sciences Center and university hospital. The university offers more than 170 majors and programs spanning 12 schools and colleges for undergraduates, post-baccalaureates, graduate, and professional students. Online and certificate programs are also available. Speech communication and rhetoric, registered nursing, and psychology topped the list of popular majors for undergraduates as of 2015. The UofL campus is home to nearly 400 student clubs and organizations, including LGBT groups, Greek life, and intramural sports. Founded by the pastor of the Pineville First Baptist Church in 1926, CCBBC provides Christ-centered programs to prepare graduates for careers in ministry and service. Clear Creek has worked alongside the Kentucky Baptist Convention since 1946 to develop ministry education programs and training; the school remains the only Kentucky college to be partnered with the KBC. Academic programs include an associate of arts (AA) in ministry, a BA in ministry, and a certificate in Bible studies. To further study in a specialized area of their choice, students may choose from electives in pastoral ministry, church ministries and leadership, and missions and evangelism. All Clear Creek students, regardless of program or academic level of study, must complete non-credit coursework in Christian service and guidance and Chapel each semester in order to graduate. Campus facilities include a low-cost health services clinic, a donation-based clothing store, and a family recreation center. Established in 1819, Centre College is an independent liberal arts college rooted in the Presbyterian tradition. As one of the smallest colleges in Kentucky, the school has an enrollment of just 1,400. Centre was recognized nationally in 2000 as being the smallest institution in history to host a general election debate, when it hosted the vice-presidential candidates that year. The vice-presidential debate was held at Centre again in 2012. The college offers more than 40 majors and programs in subjects ranging from anthropology to Latin American studies to religion. Additional programs are offered for first-year and ROTC students, as well as those interested in accelerated professional study tracks in education, nursing, and more. Centre's selective admissions policy allows for the school to keep class sizes low, so professors can give students personalized attention in both on-campus and online courses. Around 98% of Centre faculty have a PhD or equivalent in their respective area of expertise. A public, land-grant institution, UKY has served students in the Lexington area for more than 150 years. The flagship of Kentucky colleges is renowned for its more than 200 undergraduate, graduate, and professional programs across 17 academic areas. Study options range from business to healthcare to the arts; popular majors include engineering, science, and criminal justice. Undecided majors may choose the undergraduate studies program, which allows students to design their own curriculum or develop an independent study plan. The UK campus, set on 716 acres within the Bluegrass region of the state, encompasses numerous buildings including the university's own research facility and medical center. The school was recently recognized as an exemplary Honor Institution for its participation in the Harry S. Truman Foundation program, and is home to 12 Truman scholars. Midway has a colorful history among colleges in Kentucky. Originally named the Kentucky Female Orphan School when it was founded, the school has opened its enrollment to include male students. In 2016, around 77% of the school's 1,200 students were female. The university offers associate, bachelor's, and master's degrees across three academic schools: the School of Arts and Sciences, the School of Business, Equine and Sports Studies, and the School of Health Sciences. As one of the best colleges in Kentucky for its industrial and agricultural programming, MSU serves more than 11,000 students on its sprawling Murray campus. MSU's more than 60 campus buildings include an animal health technology center, an agriculture exposition center, and a rodeo barn, among other facilities dedicated to providing experiential farming and agriculture training. The university offers more than 118 programs, with options to customize majors and minors in a range of subjects, from animal science to telecommunications to criminal justice. A variety of associate, bachelor's, master's, and doctoral degrees are available, as well as certificates and independent study options. Roughly 40% of students at Murray State participate in co-op and internship experiences to supplement their academic programs. The average class comprises 19 students, allowing MSU faculty to give personalized attention to every student online and on campus. Located in the suburb of Highland Heights, seven miles southeast of Cincinnati, Ohio, Northern Kentucky University serves an enrollment of more than 15,000 students from interstate locales. Since its inception in 1968, NKU has earned a reputation as one of the fastest-growing colleges in Kentucky, even with its unique location within the Cincinnati metro area. The school is home to more than 100 associate, bachelor's, and master's programs, as well as several doctorates in education, nursing practice, and more. The university's most popular bachelor's degrees include organizational leadership, elementary education, and communications. NKU's campus has been designated as one of the most disability-friendly institutions in the U.S., and houses numerous state-of-the-art facilities including a 120-seat digitorium and the region's largest and most advanced tech center. Diverse student organizations and activities offered on campus include an independent, award-winning student-led newspaper, a radio station, and 15 NCAA Division I varsity sports. KMBC was founded in 1931 by Dr. Lela McConnell and Rev. Martha Archer in Jackson, KY. The Kentucky college is one of several prestigious higher learning institutions in the state to be established according to faith-based principles, incorporating service learning throughout. The college offers an AA in biblical studies and a BA in religion with more than 10 variable study tracks and concentration options available. Bachelor's degree students may customize their major by combining two professional areas, such as communications and Christian education, within the program. KMBC majors span five distinct academic areas: discipleship, education, general studies, ministerial studies, and music. Online courses are also available. 70% of all graduates have entered Christian ministries after receiving training at KMBC, with 18% serving as missionaries nationwide and in more than 60 foreign countries. Transylvania University is a private liberal arts community located in downtown Lexington. Founded in 1790 in the tradition of the Disciples of Christ, the school is not only among the oldest colleges in Kentucky but also the 16th-oldest college in the U.S. Transy offers 40 academic majors and programs, including customizable study options and comprehensive, highly competitive pre-professional programs. Among the university's enrollment of just over 1,000 students, more than 90% of those recommended for medical school are accepted, 100% of those recommended for law school are accepted, and 95% are in graduate school or employed within six months of graduation. Unique majors include Asian studies, chemistry, and pre-engineering. Students living on campus may take advantage of more than 50 clubs and organizations designed to promote social engagement, including Greek life, leadership retreats, and community service. Morehead State was founded in 1887 as a private, church-funded Kentucky college in Morehead. Since graduating its inaugural class of four students in 1927, MSU has expanded to include three additional campuses throughout Kentucky and now serves an enrollment of more than 11,000. The college is home to over 140 undergraduate programs, 70 graduate programs, and five education specialist doctoral programs. Courses are offered at the university's residential campus in Morehead and all four of its regional sites, as well as online. Education, biological science, and nursing are among the most popular undergraduate majors. Of the 100+ clubs and organizations offered on campus, Greek life and athletics are among the most popular. More than 15% of students participate in Greek life, and there are over 16 intercollegiate sports at MSU that are sponsored by the Ohio Valley Conference in NCAA Division I and the Pioneer Football League. Spalding was established in 1814 by the Sisters of Charity of Nazareth. Since its inception, the university has maintained a reputation as one of the best colleges in Kentucky for upholding its traditions of inclusiveness and compassion above all else; Spalding is the most racially diverse college in Kentucky, with more than 33% of students self-identifying as people of color. The school proudly serves artists, veterans, athletes, religious leaders, and the LGBTQ student community at its blended Louisville campus. Spalding is home to more than 25 undergraduate and graduate programs in a variety of liberal arts disciplines ranging from education to nursing to creative writing. All Spalding courses offered on campus and online are scheduled according to the university's unique block system, consisting of six-week course blocks with a one-week break in between. Students may choose whether to take one or more courses per each six-week term. All Spalding programs offer opportunities for students to pursue internships, practicums, or other hands-on experience. Degrees, certificates, and online programs are offered in five primary academic schools: Arts and Sciences, Business and Technology, Education, Health Sciences, and Justice and Safety. EKU hosts more than 230 registered student groups for a variety of interests and activities, including club sports, Greek life, and religious service and community projects. The university also offers one of the most comprehensive first-year orientation experiences among Kentucky colleges, fostering numerous opportunities for student engagement both in and out of the classroom. Georgetown College is located north of Lexington, east of Louisville and south of Cincinnati, OH. A historic Baptist college in Kentucky, Georgetown was the first Baptist college founded west of the Allegheny Mountains region. Since the inaugural class of fewer than 10 students graduated in 1832, Georgetown has continued to offer liberal arts, science, and professional programs with a faith-based focus. The college features more than 50 majors and programs for undergraduates and graduate students, including unique honors programs for Christian leadership and equine and science majors. Additional options range from education to computer science to public health. Students on campus may participate in a range of student activities, including faith and service groups, Greek life, and intramural sports. Bellarmine University was established in 1950 in Louisville, in the tradition of the Roman Catholic Archdiocese and under special guidance from the Conventual Franciscan Fathers. Bellarmine's campus, formerly used as a Civil War military hospital and as an orphanage, was the first among Kentucky colleges to be open to students of all races. The university offers more than 50 majors and programs across numerous liberal arts and sciences disciplines. Professional, non-credit, and degree-completion programs are available through the School of Continuing and Professional Studies. There are more than 90 student clubs and organizations on campus, from faith-based activities to Greek life to community service opportunities. Bellarmine also hosts a chapter of the Student Government Association, as well as the Women in Leadership Conference and various connections to local events and activities in the city of Louisville and the surrounding areas. Alice Lloyd College is named for its founder, Alice Spencer Geddes Lloyd, a writer, publisher, and editor by trade, as well as an advocate for driving progressive higher education opportunities for the Appalachian people in the state of Kentucky. Established in 1917 in Pippa Passes, KY, Alice Lloyd College remains one of the most financially fit colleges in Kentucky, and is renowned nationwide for graduating students with the least amount of debt. The college offers bachelor's degrees in more than 25 majors and minors, with an emphasis in professional programs in elementary and middle school education for both certified and noncertified teachers. Non-teaching programs range from accounting to English to nursing. Lloyd also offers a variety of options for undeclared majors and pre-professional students in health professions, engineering, law, and more. Character-based education has been the foundation of Lloyd programs since its inception, with campus activities including student government, student ministry opportunities, and the Circle K service group. With a main campus on a hilltop in Bowling Green and three additional campuses throughout the state, Western Kentucky University serves more than 20,000 students across its numerous locations. WKU was first among all colleges in Kentucky to develop an independent Honors College. The college is home to undergraduate and graduate programs spanning four primary areas of academic study: education, liberal arts and sciences, health sciences, and business. More than 170 undergraduate and 125 graduate majors and minors are available, including in-depth concentration options, pre-professional programs, certificates, and distance learning courses. WKU is the only college in Kentucky to be recognized as a top producer of Fulbright Scholars by the Chronicle of Higher Education. Student activities offered on campus include Greek life, student government, and leadership and volunteer opportunities. Established in 1913 as the Cumberland College by Baptist ministers, University of the Cumberlands was renamed in 2005, though the school has continued to provide its students with the same high-quality faith-based programs upon which it was founded. The Christian liberal arts school primarily serves a nine-state area in and around the Appalachian Mountains, including Kentucky, Tennessee, West Virginia, VIrginia, Georgia, North Carolina, South Carolina, Ohio, and Alabama. UC is one of the top producers of military and service leaders among colleges in Kentucky; the university counts among its esteemed alumni five military generals, two governors and a Congressman, among others. More than 40 majors and programs are offered in academic areas ranging from Christian ministry to education to the arts. CU offers both undergraduate and graduate programs, as well as online and pre-professional learning options. Of a total enrollment of more than 6,000, 48% of residents on campus are first-generation college students. The school hosts more than 15 men's, women's, and coed varsity sports and athletic teams. One of the oldest colleges in Kentucky, KWC was established in 1858 through the efforts of the Kentucky Conference of the Methodist Episcopal Church, South, in the Methodist tradition. The college's first commencement was in 1868, following the sense of peace that had been restored to the state since the end of the Civil War. KWC in Owensboro is home to 29 undergraduate and 13 pre-professional programs, including online degrees and off-campus learning options. With a close-knit community of campus students enrolled in traditional programs, the college keeps class sizes small, averaging a student-to-teacher ratio of 12:1 to maximize personal attention in the classroom. More than 25 majors are available in subjects ranging from art to mathematics to zoology. More than 88% of instructors have a terminal degree in their respective field. The college is home to 21 men's and women's NCAA Division II sports, and is a member of the Great Midwestern Athletic Conference. Originally founded as Villa Madonna College in 1921 by the Benedictine Sisters, Thomas More College has since expanded its Crestview Hills location to serve its current enrollment of more than 1,900 students. The scenic campus is set on 100 acres near the Ohio River Valley, mere minutes from downtown Cincinnati. Around 82% of the local student community lives in greater Cincinnati or the northern Kentucky region. The college offers more than 70 programs for undergraduates and graduate students, with a focus in science, research, and STEM education initiatives. Curriculum is rooted in both liberal arts and the Catholic tradition, with diverse majors ranging from business to nursing to technology. A variety of adult and professional programs, including an RN-BSN and an MBA option, are also offered in night/weekend and online formats. TMC is among the best colleges in Kentucky for students interested in joining a diverse Catholic campus; at least one representative from all Catholic high schools in the Diocese of Covington are among the current undergraduate enrollment. Located in foothills of Grayson in the eastern part of the state, KCU was founded in 1919, primarily to provide teacher and ministry training in the Christian tradition. KCU still offers some of the best teacher education and ministry programs among colleges in Kentucky, though programs in business, nursing, pre-law, and more have been added since the university's inception nearly a century ago. Today, KCU offers undergraduate and graduate degrees in dozens of majors, from biology to Bible and ministry to counseling psychology. A flexible general studies program is also available, incorporating core Bible coursework that allows the student to explore academic majors through a variety of options. Students on campus may choose from numerous groups and clubs based on diverse interests from academics to social life -- geared towards mathematics, aspiring nursing professionals, history buffs, and more. The university also hosts an Outdoor Adventure Fellowship, with exploration options of the campus' surrounding state parks, lakes, and more than 40 miles of hiking and biking trails. Brescia University was founded as a women's junior college in 1925 by the Ursuline Sisters of Mount Saint Joseph. The Catholic liberal arts college expanded over the years, became a co-ed college, and was relocated to downtown Owensboro, KY and became four-year university in 1950. Brescia's current campus in Owensboro is just a short drive from the school's original location in Maple Mount. The university offers undergraduate and graduate programs in business; education; human and behavioral sciences; math and natural sciences; social work; the humanities; and the fine arts. Majors range from psychology to computer science to theology. A variety of education and teaching specializations are also available. Students may opt to pursue a pre-professional program or enroll in an online course via Brescia's BU Online system. In addition to offering one of the state's most robust first-year orientation programs to students on campus, Brescia offers unique student groups and activities including a campus ministry, Brescia Broadcast student-led media, and comprehensive student counseling services. The University also boasts 17 competitive athletic teams. Campbellsville University's main campus is located in the town of its namesake, though the school encompasses five additional campuses and education sites throughout the state. Like the city of Campbellsville sits at the geographic center of Kentucky, Campbellsville University had adopted a fundamental approach to integrating fundamental Christian values and principles into all of its programming. The school is home to one of the most robust campus ministries among Kentucky colleges, providing chapel services, Christian concerts, and movie nights and a Christian athletes fellowship. The university offers dozens of undergraduate and graduate programs and certificates within six academic schools: Arts and Sciences, Business, Education, Music, Nursing, Ministry, and Theology. Professional programs and online learning options are also available at the main campus or one of the university's instructional sites/education centers in Louisville, Owensboro, Elizabethtown, Harrodsburg, Somerset, and Hodgenville. The Kentucky Office of Employment and Training estimates that by 2018, some form of postsecondary education will be required for 29% of all jobs and 48% of new positions in Kentucky. The state's educational apparatus is working to prepare future generations to meet the demand for an educated workforce. The Kentucky Adult Education Committee hopes to enroll 30% of the state's high school graduates in postsecondary education within two years of receiving their diploma or GED by 2020. The year 2012 marked the first time that Kentucky's associate degree attainment rate ranked above the national average. In the same year, Kentucky's Community and Technical College System (KCTCS) awarded the fourth highest number of credentials in the country among community college systems. KCTCS currently operates 16 colleges on more than 70 campuses across Kentucky. Associate degrees are also available through many of the state's public universities. A two-year associate degree is a viable option for students who have not determined what they want to study, or those who wish to complete their postsecondary education quickly and enter the workforce after two years of school. Below, we take a look at the top two-year programs in the state. MCC, one of the fastest growing community colleges in Kentucky, first opened in 1968 in Madisonville to serve western Kentucky's Pennyrile region. The school maintains three campuses across two different counties, offering associate degrees and technical training. Aspen Institute, the international nonprofit, has ranked MCC among the top 10% of all community colleges in the U.S., and the school offers particularly strong programs in advanced industrial integrated technology, nursing, and physical therapy. Madisonville was the first two-year college in Kentucky to open a fine arts center, and the school's Glema Mahr Center for the Arts offers educational programs, theater, musical performances, art exhibitions, and other cultural events to the Madisonville community. MCC was the first college in the region to open a Workforce Development Center, which focuses on customized training for local employers and employees, ranging from basic and advanced business applications to general adult education. Based in the city of Paducah, WKCTC was formed through the 2003 merger of neighboring Paducah Community College and West Kentucky Technical College. The school serves more than 8,500 students, offering unique degree programs such as automotive technology, culinary arts, diagnostic medical sonography, and marine technology. Ranking as one of the best community colleges in Kentucky, WKCTC was named one of the country's top 10 community colleges by the Aspen Institute in 2017. The college's campus boasts several unique features, including the Clemens Fine Art Center, a community space for performing and visual arts, and the Challenger Learning Center. The learning center is one of just 40 education centers around the country that utilizes space simulation learning environments to train students of all ages in science, technology, engineering, and math (STEM) programs. The learning center has operated for more than a decade, running more than 2,000 simulated missions. With two campuses in Hopkinsville and Fort Campbell, HCC is one of the top two-year colleges in Kentucky, serving more than 3,700 students. The school offers 17 program options, including agricultural technology, human services, manufacturing industrial technology, and office systems technology. Resources at HCC help students with academic and career planning. The college's advising services can help students prepare for academic study and make choices about their educational paths, offering advice to new and returning students. For students interested in pursuing a four-year degree, HCC's transfer services can help every step of the way, connecting students with recruiters, assisting with transfer applications, and helping students locate transfer scholarships. Students who prefer to pursue a career upon graduation can benefit from the school's career services office, which assists with resumes and job searches. HCC offers a nursing–practical nursing diploma. Southeast has a campus in Cumberland, Harlan, Middlesboro, Pineville, and Whitesburg. The school serves over 5,000 students in the region. SKCTC's breadth of academic programs makes it one of the top community colleges in Kentucky, and students at SKCTC can pursue a range of transfer and professional degrees. Popular programs include funeral service, mining technology, and professional pottery crafting. More than half of SKCTC students are enrolled in transfer programs, preparing them for four-year degrees at state universities. SKCTC offers the Academic Advantage Program, intended to ensure academic success through personalized counseling, advising, and tutoring. The program is open to students who are low income, differently abled, or whose parents do not hold college degrees. Academic Advantage includes transfer assistance, visits to four-year colleges, scholarship assistance, preparedness workshops, and special trips and events. Southeast offers certificates, diplomas, and transitional education courses. CTE is operated by Employment Solutions, a nonprofit organization dedicated to career training and education. Founded in 1997 in Lexington, the college operates an extension campus in Winchester. CTE doesn't offer any associate degrees, instead maintaining seven career training programs: building trades technician, office administration, early childhood education, food and hospitality professional, medical assistant, cosmetology, and cosmetology apprentice instructor. The cosmetology programs are hour-based, with 1,800 hours of instruction required for the general program and 1,000 hours for the Apprentice Instructor program. The other programs operate in a nine-month curriculum format, which requires 36 weeks of classes to complete. CTE offers robust job readiness training to all students, including mock interviewing, resume writing, career development, application assistance, and career planning. Each program at CTE provides a dedicated career consultant to help students locate employment opportunities. Serving a 10-county area in southern Kentucky, SKYCTC operates six campuses, including a main location in Bowling Green. Students at SKYCTC can choose from dozens of associate degree programs, including culinary arts, fire rescue science technology, industrial maintenance, and medical information technology, with options available for both career and transfer degrees. SKYCTC maintains 2+2 transfer agreements with several public and private schools in the state, allowing students to complete the first two years of a four-year degree at SKYCTC before transferring to earn a bachelor's. Campus students can also utilize a range of academic resources, including peer and professional tutoring offered through The Learning Center at SKYCTC. The Center offers walk-in and scheduled appointments that allow students to receive academic assistance from knowledgeable peers or instructional specialists, along with workshops that can help students build academic skills. Student organizations include the Phi Theta Kappa Honor Society, Movie Club, and Cafe 212, a culinary arts club. Marysville, founded in 1968, operates five campuses in Northeastern Kentucky, serving six counties in the region. The school ranks as one of the most affordable two-year colleges in Kentucky, and more than 80% of students receive some sort of financial aid. Marysville offers 28 programs of study, including construction technology, cosmetology, energy systems technology, and fire science. Marysville offers a fully online criminal justice program. Students can participate in a range of campus groups and clubs related to academics, the community, and professional goals. Some of the school's many groups include the Phi Theta Kappa Honor Society, the Military Student Veteran Organization, the women's resource group, Phoenix; and the Health Occupation Students of America Organization. For parents enrolled at MCTC, the school offers its Ready to Work program, which can assist with job readiness, life skills training, mentoring, academic counseling, and work-study placement opportunities. Gateway operates three campuses in Edgewood, Covington, and Florence. It's one of the only public two-year colleges in Kentucky's northern region. The school is dedicated to both the needs of students and the region's economic development, offering a range of technical and trade programs that can help students either find a job or transfer to a four-year college. Some of GCTC‘s many degree programs include air conditioning technology, cosmetology, fire/rescue science technology, and supply chain management. GCTC emphasizes hands-on learning, and the campus features two student-run businesses: the Gateway Computer Repair Shop and the Emerge Hair Studio and Spa. These businesses allow students to gain trade experience and business skills while simultaneously offering services to the campus community. For students interested in other community development opportunities, GCTC has several academic and professional campus clubs, including the National Technical Honor Society and the Student Nurse Organization. Big Sandy has provided accessible education and career training to Eastern Kentucky residents for more than 75 years with campus locations in Hager Hill, Prestonsburg, Pikeville, and Paintsville. Highly respected among community colleges in Kentucky, the school offers over 25 degree programs to a student body of nearly 5,000. Some of the school's most popular majors include electrical technology, business administration, and criminal justice. Big Sandy offers unique programs such as masonry, surveying and mapping technology, and visual communication. Students can participate in a range of campus clubs and organizations, from the Student Government Association and the Kentucky Association of Nursing Students to the Philosophy Club and the Gay Straight Alliance. Students receive free access to the campus wellness center, which includes aerobics, weights, walking trails, and other exercise equipment. The Prestonsburg location features the East Kentucky Science Center and Varia Planetarium. The facility offers interactive exhibits, a star projector, and laser light shows. Home to over 2,200 students, HCC primarily serves Henderson, Union, and Webster counties, providing workplace and college preparation to a diverse community of learners. Henderson, unique among community colleges in Kentucky, boasts innovative professional degree programs such as equine management, logistics, and marine technology, preparing students to enter the workforce. The school offers several transfer degrees, including dental assisting, agricultural technology, computer programming, and nursing. For students interested in study abroad opportunities, Henderson offers a range of English-language summer study programs in cities all over the world, including Paris, Berlin, Buenos Aires, and Tokyo. Offered through the Kentucky Institute for International Studies, most programs are between four and five weeks in length. Henderson's campus is home to the Preston Arts Center, which offers arts education and performing arts productions in music, dance, comedy, and drama. The school's honor program provided individualized projects and mentorship to motivated students. Part of the state's 16-school community and technical college system, Ashland Community and Technical College offers an assortment of associate degrees and apprenticeship programs. The school's most popular programs include the associate in arts and associate in science degrees for transferring into bachelor's programs. Students can also earn associate degrees in areas such as business administration, applied process technologies, and nursing. Ashland's graduates can apply for jobs right out of college, or can transfer to a four-year college for degrees in fields like welding, nursing, and criminal justice. Notable associate degree programs include the associate in applied science (AAS) in fire rescue science, a two-year program that immerses students in the theoretical and practical knowledge for careers in firefighting and emergency medical services. The AAS in computerized manufacturing and machining trains in-demand machine tool technicians and provides transferrable credits. One of the top community colleges in Kentucky, Ashland offers adult education courses such as GED completion and English as a Second Language. Hazard operates five campus locations in eastern Kentucky, serving more than 3,000 students from eight counties. The school offers many career and transfer degrees in more than 50 areas. HCTC is unique among two-year colleges in Kentucky for its programs in business administration systems, collision repair technology, and visual communications: multimedia. Academic offerings include the professional studio artist program, a part of Hazard's Kentucky School of Bluegrass and Technical Music. Focused on the technical, product development, design, and performance aspect of the music industry, the music program trains students for careers as independent musicians, studio technicians, business owners, and more. Students can enter programs such as bluegrass and traditional music, studio artist, and audio recording, studying the history of bluegrass music and the skills necessary for success in the music business. Hazard offers online learning programs and tutoring services. Student organizations include intramural sports and student government. ECTC operates a main campus in Elizabethtown along with additional campuses in Fort Knox, Springfield, and Leitchfield, serving an 11-county area in central Kentucky. Ranking as one of the most affordable two-year colleges in Kentucky, ECTC offers a range of academic and technical programs, enabling students to move straight into a career or pursue a four-year degree. ECTC maintains a partnership with Western Kentucky University, allowing students to transfer seamlessly into bachelor's programs at the university. Students at ECTC can transfer into several other regional colleges in Kentucky and neighboring states, including Indiana Wesleyan and the University of Louisville. The college offers several summer study abroad opportunities through the Kentucky Institute for International Studies, giving students the opportunity to take English-language academic programs all over the world. The Institute offers more than $75,000 in scholarships each year to assist students with travel expenses. Somerset, one of the fastest growing community colleges in Kentucky, operates six convenient locations in Somerset, London, Liberty, Albany, Whitley City, and Russell Springs, serving a 10-county area in the state's central and eastern regions. The school has over 30 programs of study in areas including business and professional services, health sciences, humanities, math, and natural sciences. Unique programs at Somerset include digital printing technology (3d printing), oral communications, geology and aviation maintenance technology. 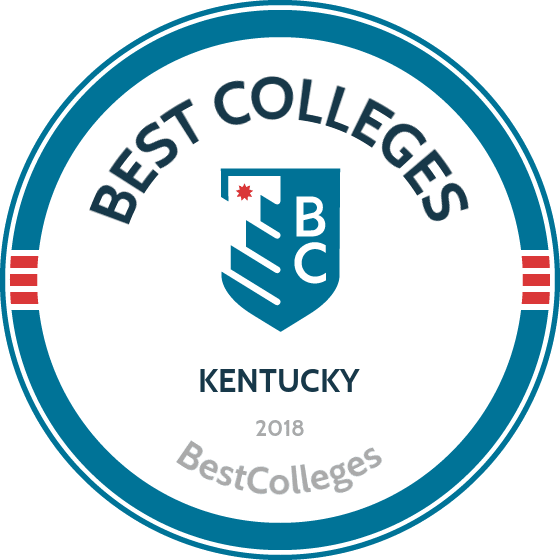 The school's range of uncommon majors speaks to an emphasis on innovation in education, and SCC is a major provider of distance education in the region, receiving praise as one of the best two-year colleges in Kentucky for online learning programs. For campus students, SCC is also home to a robust community that includes an active theater scene and The Bridge, a student-run newspaper. Online courses are taught through Blackboard. If you're thinking about applying to one of the best colleges in Kentucky, continuing reading to learn more about living in the Bluegrass State. Kentucky is known as the Bluegrass State for good reason: the land's fertile soil yields acres of the soft, emerald-colored grass found throughout the state's pastureland. Bordered by the Ohio River to the north and the Mississippi river to the west, Kentucky has more miles of running water — 1,100 navigable miles — than any state besides Alaska. Residents also enjoy views of the Appalachian Mountains, which lie across the eastern quarter of the state. Beyond its natural beauty, Kentucky is known for its southern heritage and traditions, including its signature Bluegrass music, horse racing and barbeque. The state is also a haven for Civil War buffs, and the birthplace of Abraham Lincoln. Alongside its rich tradition, Kentucky is home to thriving urban centers in its northern and southern central regions, including Louisville and Frankfort, the state capital. According to a recent study, unemployment rates fell in 119 Kentucky counties between April 2014 and 2015, and the state's unemployment rate as a whole has dropped to nearly 5%. All residents of Kentucky are eligible for in-state tuition at public colleges in the state. In-state tuition is significantly more affordable than out-of-state rates and students moving to Kentucky naturally want to establish residency to take advantage of the lower price tag. Minors must prove that their guardians live in the state to claim residency themselves. To establish Kentucky residency, a minor must reside with a parent or guardian within the state's boundaries. If the parents are divorced or separated, the minor must live with a parent in Kentucky. Minors must provide evidence that they lived with their parent in Kentucky before turning 18 and prove their intention to continue living with that parent until they begin school. You must live in Kentucky for at least one year prior to declaring residence. You must prove intent to make Kentucky your permanent home. You must prove your financial independence. Adults under age 23 may need to declare emancipation from their parents.